I know it's not quite the season for antipasta, but these are as good roughly chopped and served with a bowl of linguine and garlic as they are added to a salad or served alongside cured meats. And, if you've got a gas hob or a grill, then really you've no excuse to be buying these as they're so much nicer home made. I kept this batch really simple and seasoned them with little more than olive oil, lemon juice and a little salt and pepper. However, fresh oregano or even some sliced garlic added to the marinade is also delicious so feel free to experiment. This makes enough to fill two 350g jars, and they will easily keep in the fridge for a couple of weeks so don't feel you need to use them all at once. They're great to have in stock for quick suppers and unexpected entertaining! I used a gas hob to make these, but if you don't have one, don't worry - a grill will work almost as well. Taking care not to burn yourself, char the peppers all over until the skin is blackened and sooty. Place in a clean plastic bag to let them sweat for 10 minutes then carefully peel off the burned skin. Try not to do this under running water as you'll wash delicious flavours down the sink. 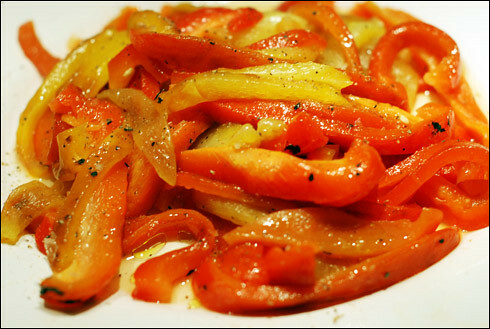 Once peeled, deseed and slice the peppers on a plate before transferring to a mixing bowl. Make sure you pour any juice on the plate into the bowl too! Finally, add a tablespoon of olive oil, a tablespoon of lemon juice and salt and pepper to taste. As I said earlier, adding a little shredded fresh oregano at this point adds a lovely flavour to the peppers, so you might want to do that. Toss all the ingredients together until well-mixed, then transfer into jars and keep in the fridge. If eating them cold, bring to room temperature before serving. your meal is incomplete with this beautiful grilled pepper and cheese salad. Use red, yellow and green peppers to make the salad look full of colour. Served on a bed of crisp lettuce, this recipe calls for alfalfa sprouts too, making it rich in nutrients. The zingy olive oil, vinegar, pepper and sugar dressing makes this one of the best salads that is enjoyed by all.